When I first read The Household Guide to Dying it felt as if the writer, Debra Adelaide, had somehow stepped inside my head for a while and borrowed my voice. Even though at the time I had no daughters, and I certainly wasn’t dying of cancer, the words felt like they were mine: effortless, flowing, perfectly formed, and delivered with precision timing (at certain key points). There was nothing sentimental about Delia Bennet’s experience of confronting death. It was head on. Even funny. (I got the same tragi-comic feeling reading Sarah Watt’s exquisite contributions to Worse Things Happen at Sea, the memoir she wrote with husband William McInnes, when she was approaching her final days with courage and quiet humour.) Delia plans for the important things. Like how to teach her girls to make the perfect cup of tea. Like whether she is going to fit in her coffin and whether she should practise before the final day comes. When my aunt died of breast cancer, and I grieved deeply for the loss of a true friend, I turned to Debra’s book often, as a self-help guide — as its title so cleverly predicted I would. Often friends will say ‘I only read nonfiction’, dismissing novels because the words are not true, as if fictional worlds are somehow empty of meaning. But I’ve always found the opposite: fiction frees the writer to explore darker subjects from a number of angles, not often exposed in memoir or autobiography. As a reader, since a child, I have learnt so much about emotions, about how to tackle the big issues of life vs death, from fictional characters I have loved (and Delia is one). Debra Adelaide is also a mother, and she’s been interested in mothers in various guises. She has edited three collections of stories about mothering — Motherlove, Motherlove 2 and Cutting the Cord — with stories from many well-known authors. I spoke to Debra about her experience of balancing the writing life with having children. When you were pregnant, what were your expectations regarding having a baby and writing? Were you planning to write after the baby was born? DA: My expectations were completely and totally unrealistic. I’d been told that new babies just slept all the time, so I planned accordingly. With my first pregnancy I was still researching my doctorate, which I submitted when my baby was five months old. I had completed all the research by the time he was born and was planning to finalise writing up the material after the birth. With the second and the third babies, I had finished drafts of novels while pregnant, and managed to complete revisions before each birth to free myself up — for a while. What was it like in reality? Did you get any writing done in the first year after your baby was born? DA: Of course, working on anything took a lot longer than I imagined, especially after the first birth, and it was not just a matter of constraints on time and sleep deprivation. I had completely failed to factor in one vital thing — my desire to sit and gaze at my baby. I had simply no idea how much time I would be spending just being this baby’s mother, and that was as much physical as it was emotional. And I had no understanding before the event that I would desire this more than anything — more than wanting to read or write, I found I just wanted to sit with him, play with him, sing to him, gaze into his beautiful eyes, wait to catch the first smile, and so on. Obviously I was much more prepared for this with the other two, and less expectant that I would get other, writing, work done. Did you find it difficult to sit down and write? Or was it the opposite? Were you more creative, as you had less time, and had to be super disciplined? DA: I became extremely disciplined. My writing/working days were totally focused. Sometimes I was like a general on operations. For the first time I learned to use small pockets of time, like an hour when the children slept. Previously I could work hard but I always felt I needed an entire day to focus on a project. I also began to work at night, often very late at night. And I started to write creatively when I was pregnant with my second child. In fact, I decided to write the novel The Hotel Albatross the day before I went into labour with her. Did you find the experience of motherhood starting to seep into your characters? Into the way you portray people? DA: Seep is not quite the right word. Since becoming a mother changed everything about me, it also changed my writing. But I’m not conscious that my characters were particularly defined by any of this unless of course they happened to be mothers. But I didn’t create mother characters for a long time, not until I had the idea for the novel that became The Household Guide to Dying. Have you written about any mothers in your fiction before or after the birth? Did having a child mean you had to go back and rewrite or change characterisation? Do you approach the writing of mother characters any differently from other characters? 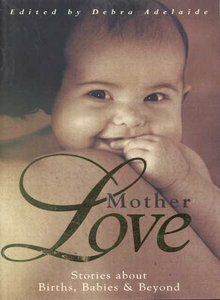 DA: My awareness of how little mothers had written about their experiences of birth, babies, children and so on, led me to edit three collections on the topic, Motherlove, Motherlove 2 and Cutting the Cord. However I wasn’t conscious of this experience affecting my fiction until I wrote The Household Guide to Dying, which, among other things, is deeply informed by a mother’s sensibility, especially in relation to how that mother imagines her family coping after she is dead. There are parts of that novel I expect I could not have written without the experience of being a mother myself. And, interestingly, I always thought the novel was about dying, and books, and poetry, and gardens, and all sorts of stuff, whereas other readers see it as essentially about mothering; one reviewer said it created a ‘poetics of mothering’, something I quite like, though I don’t pretend fully to understand what that means. I haven’t changed anything about characters because of having children of my own, but on the other hand it is more than likely that I’ve avoided writing about certain things because of the fact. I am not conscious that creating a mother character requires anything special, different, from any other sort of character, but of course one cannot avoid what one understands or knows or apprehends. If you were going to die, what would you hope to teach your children before you left? It’s a confronting question to think about…I’d appreciate any comments. If you enjoyed this post, you might also like others in the ‘Writing Mothers’ series: see interviews with Anna Funder, Fiona McGregor, Karen Andrews and Bianca Wordley. I’ve created a Wild Colonial Girl page on Facebook. If you could LIKE it, I would be hugely grateful! I’m not sure I’d want to teach my kids anything if I were dying. I’m not sure I’ve got any special knowledge! Which probably says more about my lack of skills than anything else. I certainly don’t know how to make a perfect cup of tea and have a very different notion of what is a perfect cup of tea than my eldest daughter has. I would want to tell them not to make the mistakes I’ve made (again – more about my ineptitude!). Since my mother died a year ago I’ve missed the stories. I wish I had have recorded the stories she used to tell – about our childhood, about our Dad and about her past and her family history. I feel like I’m forgetting the details and the facts are all slightly changing places in my head – like when you turn a kaleidoscope and the crystals fall into a different formation. Loving the series on writers/mothers. Inspirational! A lovely comment, thanks Julianne. I certainly have no skill in making a perfect cup of tea, or anything domestic for that matter! Probably one of the reasons I enjoyed the book so much. It is sad how quickly we forget the stories, and the nuances. Do you have any video of your mother speaking? So often, though, videos are of social occasions, not of the everyday. It’s reminded me how important it is even just to have voices preserved, to listen to later on. My husband has recorded himself (and my son) telling stories and put it on a CD. My three year old just loves to sit in bed and listen to it. That’s so lovely that your husband has recorded himself telling stories! SO gorgeous! Unfortunately we only have video footage of Mum once she was already sick. She was a great one for a saying or proverb, so I’m trying to remember those and am writing them down. As you rightly point out, it is the nuances of speech that are very individual. My Dad died when I was little and we knew Mum had a tape recording of him singing. We never ever listened to it. When I was an adult I was brave enough to ask her for it so I could make a digital copy. It was Dad with the school choir (he was the teacher)and he was singing the lullaby “All through the Night”. “Sleep my child and peace attend thee, all through the night”. Very special. Oh, that must have been wonderful, to hear your dad sing. And a lullaby. Do you have any young children? You could play it at sleep time… Often the focus is on the visuals, but the sound of people speaking or singing, it’s so intimate, somehow. My father died last week and my daughter was deleting messages and the answering machine last night and I wondered if he was on there…sadly not. Orwell has 11 rules for the perfect cup of tea! I’m going to try this today! Terrific interview, Kirsten. I also loved Debra’s novel The Household Guide to Dying and it was great to learn more about her. Perhaps I have a morbid sensibility, but I often think about what I want to write down for my daughter in case of my death. Mostly I want to tell her how wonderful she is and how much I love her. But I’ve also given both my parents — now in their 70s and Mum in remission from cancer for the second time — a list of questions I would like them to answer about their lives, loves and values. I’ve told them I don’t need to read the answers while they are still alive, but they’re all questions I would regret not having had the chance to have answered. Ah Kirsten, I had such great intentions when my daughter was born and I actually wrote a letter to her every 3 MONTHS until she was two. Her third year, which we spent in Cambodia, was documented on my travelling with children blog but I’ve slacked off since then. She’ll be seven in December and I am inspired again by your blog to make time to write that annual letter. I went to Cambodia for a month or so and loved it so much. What were you doing there? I’d love to read your blog of that time if you could provide address. Apologies for the delay. Been off sick — even off-line. Travel blog is called Oh, The Places You’ll Go and the URL is http://greatbalancingact.wordpress.com The posts about Cambodia go back to the start and continue to June 2009. I’ve been trying to maintain it as a travelling with children blog since though I only post sporadically. Sheesh! You are such a lovely mother! A birthday letter is a beautiful idea. I had done that for Christmas each year for ages, my stepmother gave them back to me last year, the boys said I should adapt them for the blog. Think I might. And take up the funny OMG moments of each year again. Strange how you can make the worst into something laughable if you need to. Sorry to hear about your dad. I find when someone close to me has passed away, I just can’t delete their name and number from my mobile. I also like their voice left on the answering machine for ages too. What a great series! I’m glad to have found your blog. Thanks, Cari. I have added a link to your blog from my FB page (http://www.facebook.com/wildcolonialgirl) as it such a great interview with Geraldine Brooks. Do you know any other blogs about writing and parenting? Thanks for linking. I’m sure there are plenty, but I haven’t come across them. My blog reading time is rather limited these days, I’m afraid. What would I like to teach my children if I wasn’t going to be there for them? I used to worry about that as a single parent. They would miss a whole different cultural feel for life. I worried that they wouldn’t learn to love the things that are free. Playing, loving clouds, running in the wind, dogs and other animals that lick your face, but most of all that look and wave of emotion that says ‘no matter what’s happening, no matter what you’ve done, no matter how bad it feels, it will be alright, it has to be.’ Unfortunately, I recognised that dying on your children made them realise things aren’t always alright. I’m immensely grateful that I’ve had the time to spend with them. I adore taking my daughter thru her teens years, but I love that she has such a loving but thoroughly down to earth person with an enormous sense of humour. I hope I’m around for many years to come but I love what I see of my children as adults and near adults.